At IBC 2018, I stopped by the Rotolight stand where I spoke to Rod from Rotolight about their latest NEO 2 Explorer Kit and other innovative LED lights such as the Rotolight AEOS and ANOVA Pro 2. Some of you may be familiar with the Rotolight NEO 2, which has been around for a year, but now is available in a new 3-Light Explorer kit with a soft carry bag in addition to a hard-Pelicase style set. The NEO 2 is 85% brighter in continuous mode than its predecessor, while preserving the same compact and portable form factor. 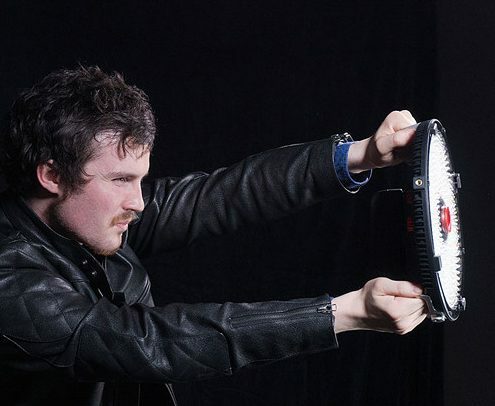 The Rotolight NEO 2 is the quite special little, but punchy round LED light, that combines the ‘shoot what you see’ benefits of continuous light, with the flexibility of High-Speed Sync (HSS) flash, for more power or to freeze action. With no recycle time, it allows photographers to never miss a shot. Designed for portrait photographers and videographers on the go, NEO 2 is lightweight and portable and can be mounted both on or off camera. A built in Elinchrom Skyport flash receiver delivers ultra reliable wireless triggering(1/8000th) up to 200m(656ft). You can power it by 6 AA batteries, DC or DTaP. The NEO 2 boasts outstanding colour reproduction, with a gorgeous soft light output and Rotolight’s signature catch light effect. 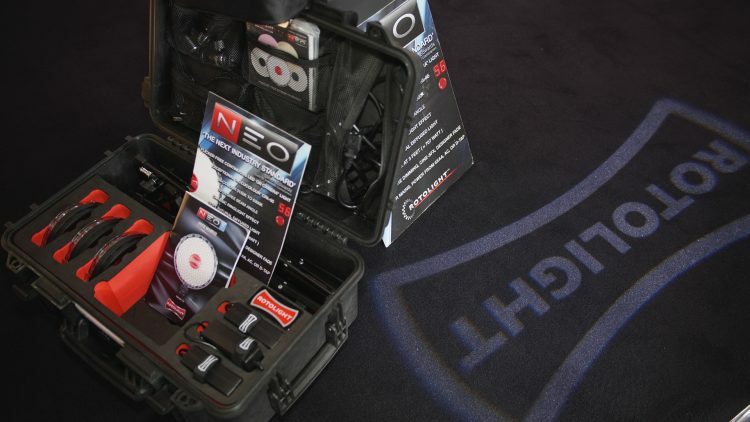 The NEO 2 is packed with features such as includes True Aperture Dimming, Designer Fade, and an updated arsenal of CineSFX custom lighting effects (Lightning, Fire, TV etc.). 250% on AA (NiMh or Li-ion) batteries. or 1.5 hours continuous output at max power. The Rotolight AEOS is another powerful, and ultra-portable, (albeit bigger than the NEO 2) all in one bi-colour LED light and HSS flash that brings tremendous versatility to any shoot. Designed for portrait and location photographers and videographers on the move, AEOS is a bi-colour, location LED light with a unique ‘ultra-thin’ design concept. The AEOS comes in under 1.5kg and just 1 cm (<1”) thick making it one of the most portable lights on the market. The ergonomic handles on the side makes it easy for users to “Hollywood”-style handhold the light in various situations. The AEOS boasts a powerful output of 5750 lux @ 3ft, high colour accuracy (CRI:96+/TLCI 91) for perfect skin tones, and unrivalled battery performance (3 hours on a single 95 w/h battery), making it the the perfect light for any location shoot. At IBC 2018, I caught up with Rod from Rotolight, who walked me through the features of the AEOS. gives you a powerful HSS flash mode with zero recycle time at 200% of the maximum continuous light output for traditional photographic work enabling you to ‘freeze action’. This feature eliminates the need for users shooting both stills and video to buy a strobe, as it provides an all-in-one solution. provides a suite of customizable cinematic lighting effects, such as lightning, fire and TV flicker to enhance your video production. LED phosphor technology ensures the AEOS delivers exceptional colour rendering (CRI:96+, TLCI 91) for accurate skin tones and colours. You can pick up a Rotolight AEOS for about $896 at B&H, or £667 + VAT in the UK directly from Rotolight. 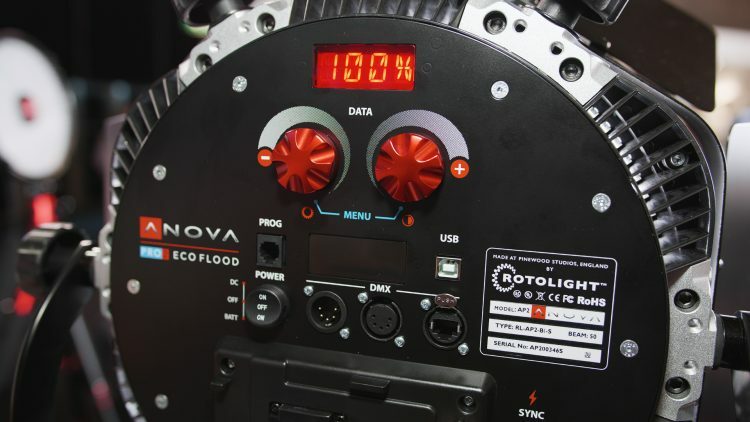 And last, but not least, I took a look at the Rotolight ANOVA Pro 2, which is their top-of-the-line LED light. It is bigger than the AEOS, and is one of the brightest LED lights ever launched in its class with a staggering output of 10,700 lux at 3 feet, which makes it 70% more power output than its predecessor. Power consumption for such a powerful LED light is quite manageable with only 72W consumption, the Rotolight Anova PRO 2 reduces operating costs for studio operation, whilst providing unrivalled battery performance on location. It is available as either a Bi-Colour 50 degree version (priced at $1680 US at B&H) or a 110 degree version bi-colour version priced at the same level. You can also get the “SOLO” version, which is Daylight balanced for $1625 at B&H. As with the NEO 2 and AEOS, the ANOVA Pro 2 gets the high-speed sync flash and special effects capabilities. For more of our IBC 2018 coverage check out this link here. Many thanks to Rod from Rotolight for spending the time with us and the very informative demos at their IBC stand. For more details and full specs of the Rotolight AEOS, NEO 2 and ANOVA PRO 2 head over to their website here.